1X2 Magnets – 4 Reasons Why You Should Believe in Smaller the Strongest Theory? 1×2 magnets easily make you believe in the old saying “smaller the strongest”. Perhaps after reading this blog, you will understand this term more appropriately. Earlier marketers and individuals used to invest in large promotional items or gifts thinking that big is always better. With the advent of magnet advertising, they have realized that “small is always better.” Today, many businesses have taken up advertising through magnets to reach to their customers in style. It is a well-known fact that promotional magnets are the regular feature in almost 70% of homes around the US. As you know, there are two sides for a coin – head and tail. Similarly, there are two sides for magnet advertising – first it manages to stick brand information deeply into their consciousness and next it may get intrusive at times. There might come a time, when a recipient may decide to remove some large sized promotional magnets from their refrigerator door alleging that it is taking up space. In such situations, small custom magnets may receive special attention. You can always utilize this benefit of doubt for positioning your brand information. Any small magnet bearing a business logo or other important information is going to grab prominent footage over the refrigerator doors. Today, you might have seen rising penchant for small and purposeful promotional gifts. This is why marketers are busier in dealing with small promotional gifts, which takes them closer to their prospective customers. Small magnets are indeed in vogue because they easily buy attention with their small size. People would happily allow them to stay over their refrigerator doors or work cabinet without second thoughts. You might have thought that impressive promotional items cost bombs because that is the vague truth. However, when it comes to customized magnets, the same is not true. 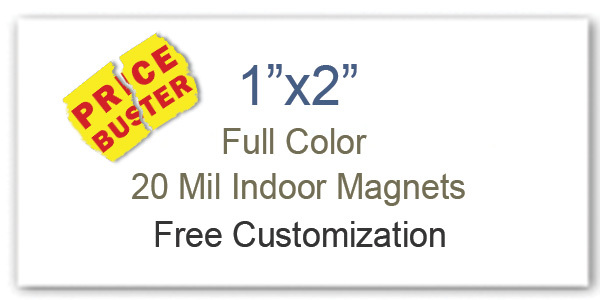 You can easily get rid of your myth by investing in customized magnets 2×1 offered at amazingly low prices. You can further your savings on bulk ordering it. Working with large promotional items and small promotional items are equally challenging because creativity takes the front seat. While working with small sized 2×1 magnets, you need to get hyper-creative to make best use of it. As you can understand, space is the big constraint, which means you have to come up with ways to persuade customer to take note of your information. Some of the most reputed online magnet stores under consideration may offer you benefit of free full color printing, which allows you to be creative and expressive at the same time. You can position your business logo or symbol in full color over these magnets for better visibility. Remember printing your brand slogan or other brand information may not be the right choice because people cannot crane their neck to see what is written on these small magnets. Therefore, 1×2 magnets can easily bring out hyper-creative individual in you. Smart advertising is the term, which perfectly synchronizes with these customized 1×2 magnets. You can avail them at fractional costs and employ them for promoting your brand without any added efforts.